Jordan has the respiratory crud that I had a few weeks ago. (during Rick's birthday) At times it felt flu like, it stayed with me for over two weeks. It grabbed him Friday. He loves banana walnut bread so I made him a loaf today. Comfort food really does comfort doesn't it? It has been another beautiful mild day, but rain moves in tomorrow and stays around until Thursday. Mild wet days will turn to cooler dry ones by Friday. This morning on our walk I cut forsythia branches and put them in vases of warm water. There were tiny buds on them. I am hoping in a couple of days, tiny golden bells will blossom. The house seems so sad with blossoms. The weekends go so fast. How can Monday be tomorrow? Start the week with love and kindness, end the week the same way. 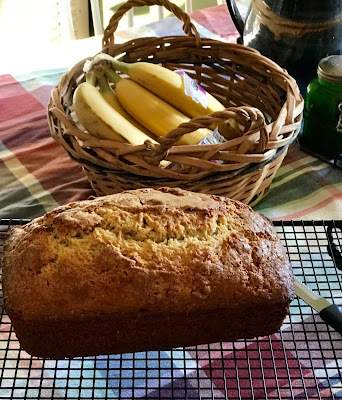 Wish I could send you all a slice of banana walnut bread. The banana walnut bread looks yummy. I hope Jordan feels well soon. Already February 4th, where does the time go? The yellow blossoms will brighten the place. That's what I need on this gloomy somber day. Mmmmmm....I think I can smell it even today! I agree, the weekends fly by but I was on call this past weekend and it's the only time I really look forward to Monday morning when the call is over!